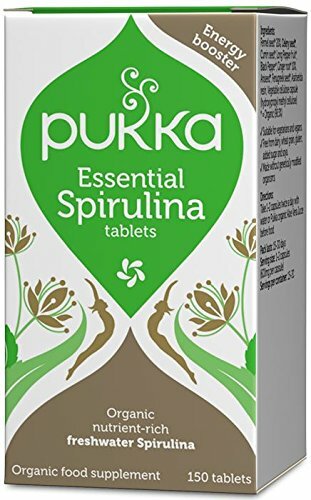 Pukka Essential Spirulina – Freshwater Spirulina – 175gram Powder. Spirulina has a unique nutritional profile that nourishes, supports and gently strengthens the body. Spirulina is a microscopic blue-green freshwater plant. Its ability to capture the suns energy helps it to become one of the most nutritionally dense foods in the world. It contains over 100 nutrients including the anti-oxidant phycocyanin and an easily digestible broad spectrum of vitamins, mineral, amino acids, proteins, antioxidants, essential fatty acids and nucleic acids. Rich in B vitamins, especially B12.